MyPhone Vortex is the second phone under the Agua series since MyPhone adopted its new naming system. It’s has a smaller screen at 5 inches but with removable battery, aluminum frame and similar software features. 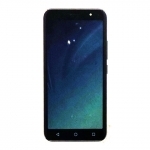 MyPhone Vortex has the usual specs of the current quad core phone in the Philippines. 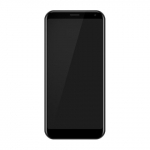 It’s powered by a 1.2GHz quad core Cortex A7 chip from MediaTek in combo with PowerVR SGX 544MP graphics processor and 1GB of RAM. 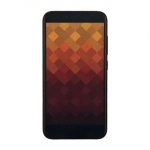 It will come with Android 4.2 out of the box with 16GB of internal storage. Around 10GB of that will be available to the user. Thankfully, there’s a slot for a 32GB MicroSD for those who need more storage space. That’s a big plus compared to MyPhone Iceberg. The battery of MyPhone Vortex might raise a concern though. It’s just a 2000 mAh Lithium-ion battery. But with moderate use, it can last a day. 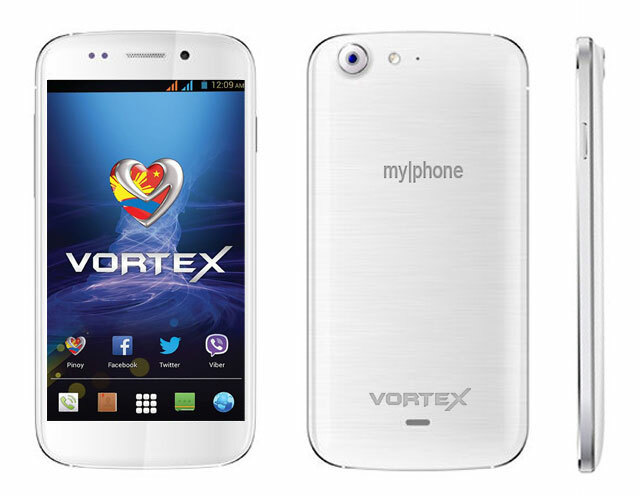 MyPhone Vortex is available in white and black. 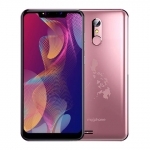 MyPhone Vortex is a gorgeous phone with a premium look and premium feel thanks to its anodized aluminum frame and metallic brush finish at the back. Just like MyPhone Iceberg, Vortex doesn’t have the Philippine map at its back too. It’s 5-inch high definition IPS display is reportedly a bit dim when hit by direct sunlight but otherwise displays high quality graphics. It’s also protected by a layer of Gorilla Glass 2 making it scratch resistant. The front has three capacitive buttons with backlight that turns on when needed and a row of sensors at the top with the 5MP front camera. 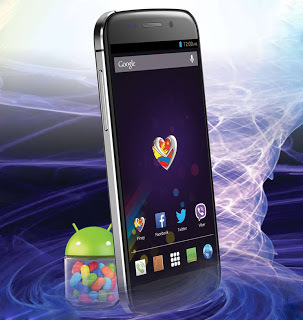 Here comes the special software features of MyPhone Vortex! Let’s start with its blow air or shake to unlock feature. It’s a feature that appeals tom many people due to its novelty. But if you don’t like it or you are concerned with accidentally unlocking your phone when it is accidentally shaken, you can disable this option. Update: I did not observe this feature implemented when I got my hands on review of MyPhone Vortex. While playing music, you can play, pause or skip a track by just waving your hands in front of MyPhone Vortex. It’s like the Air Shuffle of O+ phones. You can also take a picture and even unlock your MyPhone Vortex by just waving! Aside from controlling music, you can also put the phone near your ear when you receive a call to answer it automatically. If you want to call someone, just key in his or her number and put your phone near your ear again. During an active call, you can turn on the loudspeaker by putting the phone face down. The same gesture will put Vortex in silent mode when there is no active call. MyPhone Vortex has a feature that will delight multi-taskers. You can browse the web using the pop-up browser on top of any app that you are using. This feature is called Smart Pause in Samsung devices and it works well with MyPhone Vortex. The phone can detect if you look away from your phone’s screen while watching a video and diligently pauses the video for you. 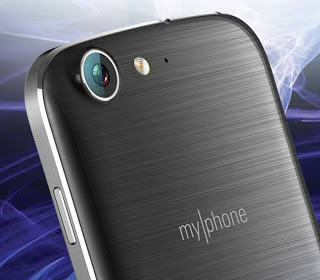 MyPhone Vortex is equipped with a 13 Megapixel camera at the back with a Sony BSI sensor and LED flash. It takes good quality pictures but not really great pictures – the same with Iceberg. What’s interesting with the camera of MyPhone Vortex is its ability to take panorama images from bottom to top. That’s unlike the most common horizontal way of taking panorama images. For the front camera, there’s a 5MP sensor that can take good quality selfies for Facebook and Instagram. MyPhone Vortex can connect to 3G networks and provide you with up to 42Mbps download speed. 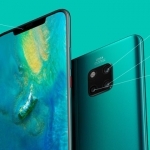 It can also scale down to EDGE and GPRS data connectivity if 3G isn’t available. WiFi is of course present with the ability to create WiFi hotspot. Bluetooth, GPS and FM Radio are also present. MyPhone Vortex comes with a free 8GB microSD card for free and the usual high quality earphones and mobile charger. 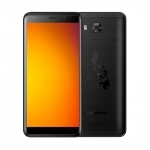 If you have cash, you can buy a MyPhone Vortex for ₱12,388 or you can avail the installment plan at ₱2,064.67 per month for six months or ₱516.17 per month for a 2-year term. Find a branch of Automatic Centere in your area and prepare your credit card. 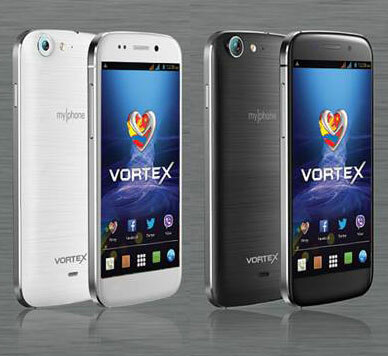 Share your comments below and let us know what you think about MyPhone Vortex. I know some who are eager to get their hands on the Unstoppable Force!